Lighthouse Point was named for the Hillsboro Inlet Lighthouse, which is located in nearby Hillsboro Beach. 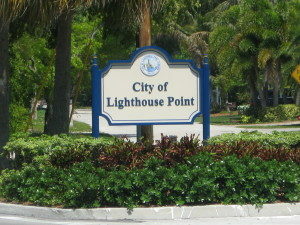 As of the 2010 census, the population of Lighthouse Point was just over 10,000. It has a total area of 2.4 square miles. It is located in northeast Broward County adjacent to Deerfield Beach to its north; Pompano Beach to its west and south; and with Hillsboro Beach to its east, across the Intracoastal Waterway. Nestled at the mouth of the Atlantic Ocean, Lighthouse Point is known for boating, fishing, scuba diving as well as a relaxing, intimate, recreational lifestyle. It’s a small town that wishes to remain so. Tucked in among many other communities, it cannot expand. The attractive neighborhoods are quiet, tree shaded, and water-laced. Lighthouse Point Real Estate is some of the most sought after properties in our area considering the beautiful views of the lighthouse and ocean. Of the residences in Lighthouse Point Real Estate, 80% are single family homes, many of which front on its 18 miles of waterways. Lighthouse Point provides a friendly atmosphere to young and old alike. You can find more newer construction single family homes in Lighthouse Point than in the Fort Lauderdale, Pompano area. There is a decent selection of waterfront town homes also. Recreation amenities include the Lighthouse Point Tennis Center and Dan Witt Park for playing sports, in addition to natural environment parks and mini-parks. It is the home to the nationally-renowned Lighthouse Point Yacht & Racquet Club, which is recognized for its personalized service, friendly ambience and attention to detail. the City of Lighthouse Point website. to view Lighthouse Point Real Estate.